I have been wanting to try grilled pizza for ages. My parents do it all the time and they like using Naan bread (Indian flat bread) so I picked some up at Wegman's one day. We made these for lunch one weekend and everyone picked their own toppings. I wanted something light and fresh without traditional pizza sauce so I went with fresh tomatoes, mozzarella, arugula, and some spicy Italian sausage. Jon wanted something more traditional as did the little one, so they both used sauce, cheese, and sausage. That's what I love about making personal pizzas - you can set out a toppings bar and let everyone assemble their own. I cannot get over how fabulous these were! The bread got nice and crispy and wasn't too doughy like pizza can sometimes be. Besides loving the way these tasted, I have two other favorite things about them. First, no need to turn on the oven and heat up the house. And second, removing the foil for the last 30 seconds of grilling really crisped up the bottoms and gave them that charred taste (a good char!) you get with wood or coal oven pizzas. 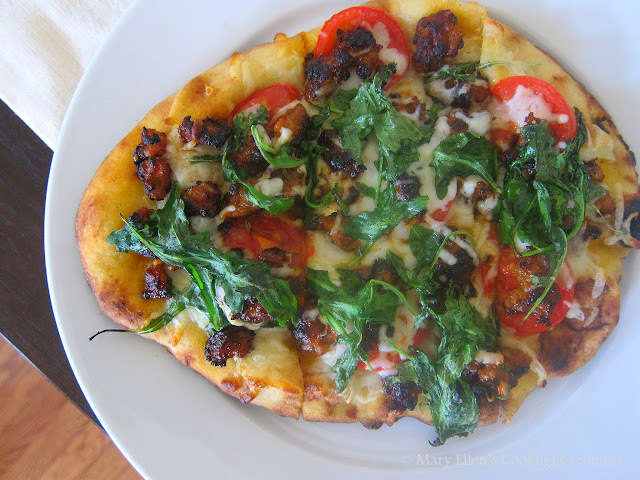 Forget traditional pizza crust - I'm hooked on Naan and think these will be a go-to dinner when we want something simple and on the grill this summer. Brush the toppings side of your Naan with a touch of olive oil. Layer your pizza - tomatoes, mozzarella, and sausage. Place a sheet of foil on a hot grill and place the pizza on top of the foil. Let cook approximately 8 minutes with the grill lid closed. 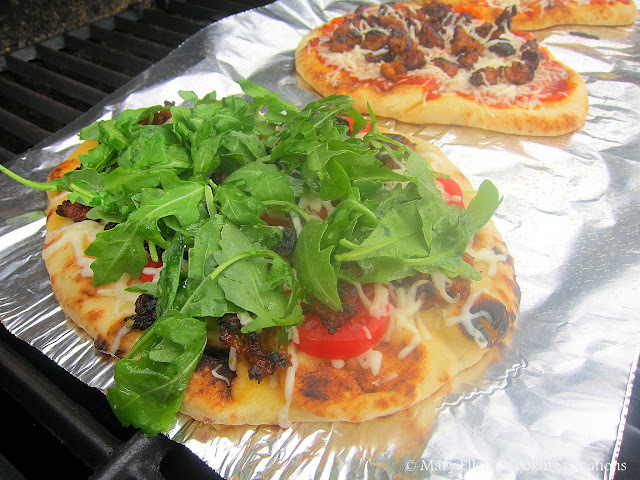 Once the pizza is almost as crispy as you want it, add the arugula. Close the lid and let the arugula wilt. If you want an extra crispy and slightly charred pizza, pull the foil off the grill and let the pizza cook another 20-30 seconds, watching it carefully. 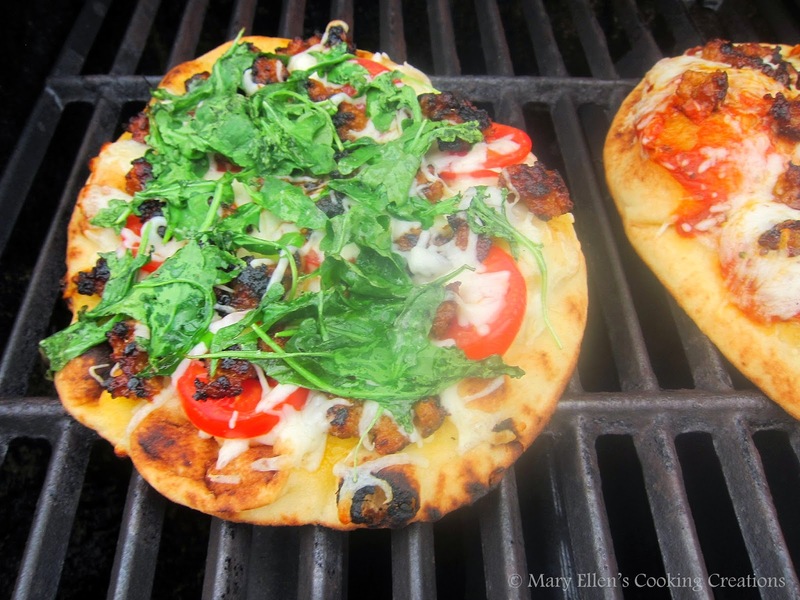 Grilled pizza has to be one of life's little pleasures! I'll have to try the Naan for pizza! I've been making a thin crust pizza and rolling it out on a rectangular pan as it is easier to get a thin crust that way. But your Naan pizzas look really good. And I love the idea of grilling them. These look great! 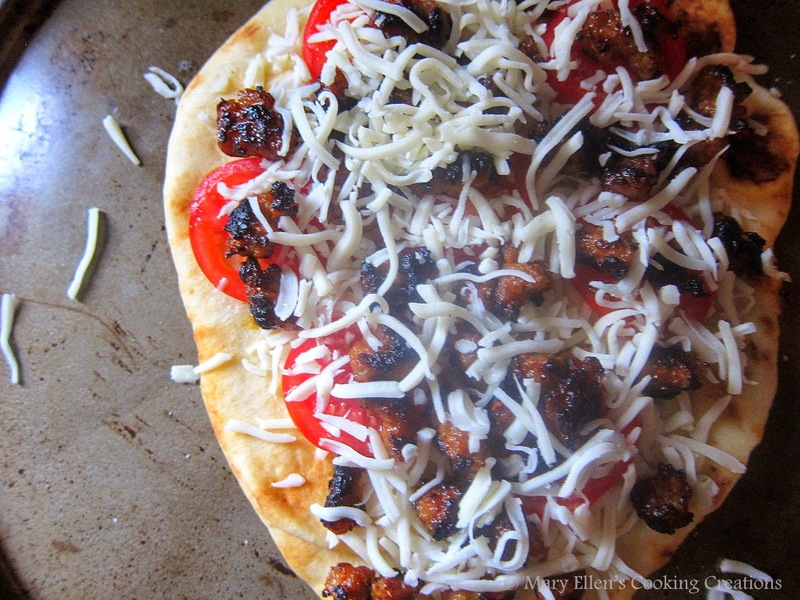 I make grilled flatbread pizza all summer because I don't want to turn on the oven.